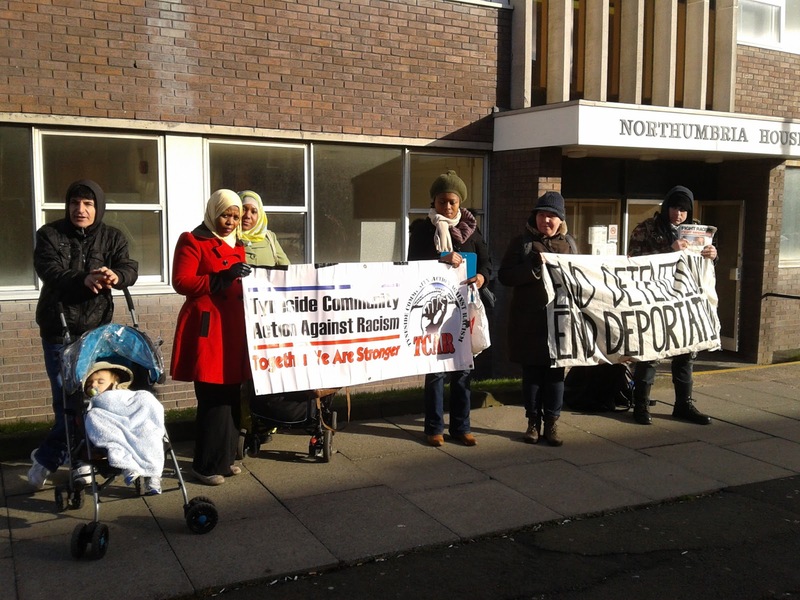 On Friday 1st February, the date set for the deportation of Hassanat Omeneke Aliyu and her three daughters, TCAR members and supporters demonstrated against their removal, and in solidarity with the family. The protest took place outside of Northumbria House, the immigration reporting centre for the North East, and attracted other asylum seekers who described their experiences of imprisonment and poverty at the hands of the racist system. The protest demanded an end to Hassanat's deportation and to all detention and deportations. Hassanat fled Nigeria in 2006 with her one year old daughter, who was threatened with Female Genital Cutting (FGC). They were trafficked to Britain and have been living here for 6 and a half years, and are currently living in Newcastle. Hassanat now has three young daughters who have grown up here and become part of the community, attending Byker Primary School. Demonstrators spoke on a megaphone about the racism at the heart of the immigration system. The government claims to support victims of trafficking and girls at risk of FGC yet they are directly contradicting this with their actions; they are knowingly putting Hassanat and her daughters in danger. The UNHCR (United Nations High Commission for Refugees) and other agencies of the United Nations have stated that refugee and asylum status should be granted to women and girls fleeing their country to escape genital cutting. The British government committed to opt into the EU’s directive on human trafficking in July 2011. The directive is focused on 'prevention and combating trafficking in human beings and protecting its victims'. We demand that the government live up to their promises on human trafficking and comply with the UNHCR's statement on FGC. Protesters also described how asylum seekers are criminalised for seeking safety and refuge, often fleeing from countries which have been exploited and plundered by Britain. Justice for Hassanat and her daughters! Justice for all!